Authors: Douglas Hodson, Q.C., Jeff Lee, Q.C. 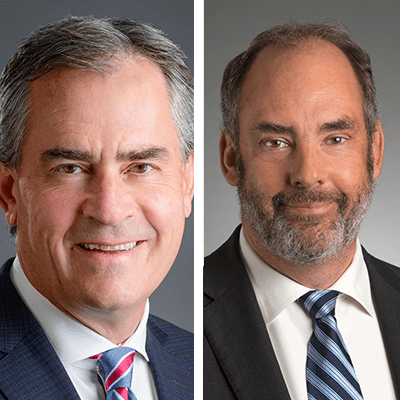 Saskatoon lawyers Douglas Hodson and Jeff Lee are included among Canada’s leading litigation lawyers in Lexpert’s Special Edition on Litigation, published in the November 30 issue of the Globe and Mail’s Report on Business Magazine. The special edition profiles Lexpert-ranked lawyers who work in several areas of business-related litigation, and also includes feature articles on commercial and securities litigation, arbitration and alternative dispute resolution. Approximately 190,000 copies of the special edition are included as a bound-in insert of Report on Business Magazine. The firm congratulates Doug and Jeff on this well-deserved recognition. With a background in commercial litigation and a wealth of experience in class actions, transportation law and construction litigation, Doug has argued cases before all levels of court in Saskatchewan, Alberta and Ontario, and before the Federal Courts and the Supreme Court of Canada. Jeff has extensive experience in shareholder disputes and represents companies in financial distress, lenders and court officers in restructuring and insolvency proceedings. He has appeared before the Superior Courts in British Columbia, Alberta, Saskatchewan, Manitoba and New Brunswick; Appellate Courts in Alberta, Saskatchewan and Manitoba; and before the Federal Court, Tax Court and Supreme Court of Canada.